John 11:19-26 – And many of the Jews came to Martha and Mary, to comfort them concerning their brother. Then Martha, as soon as she heard that Jesus was coming, went and met him:but Mary sat still in the house. Then said Martha unto Jesus, Lord, if thou hadst been here, my brother had not died. But I know, that even now, whatsoever thou wilt ask of God, God will give it thee. Jesus saith unto her, Thy brother shall rise again. Martha saith unto him, I know that he shall rise again in the resurrection at the last day. Jesus said unto her, I am the resurrection, and the life:he that believeth in me, though he were dead, yet shall he live: And whosoever liveth and believeth in me shall never die. Believest thou this? Jesus Christ has many names. One of His spectacular names is “The resurrection and the life”. Many people are today called Jesus, Emmanuel, Christos, etc. No one can, however, be called “The resurrection and the life”. I can even say that among the Trinity Almighty; it is only Jesus can can bear that name, though God the Father and God the Holy Ghost played a great part in Jesus actualisation of that name. No wonder the bible says “God has given Him a name that is higher than every other name, that at the name of Jesus every knee must bow and every tongue confess that Jesus is Lord”. This is because God cannot die. For Jesus to earn that name; He had to first become a man to die and rose again by the power of the Holy Ghost. It is only in Christ Jesus also that one can have life; as all men are born dead in sin. Based on what Jesus answered Martha, Jesus did not even need to pray to the Father to effect resurrection. He could just command it. Then they took away the stone from the place where the dead was laid. And Jesus lifted up his eyes, and said, Father, I thank thee that thou hast heard me. And I knew that thou hearest me always:but because of the people which stand by I said it, that they may believe that thou hast sent me. Jesus does not need to wait for a distant time in the future to do what He can do today. Those who need a resurrection from Jesus today must believe they can receive. Why is Jesus the resurrection and not a resurrection? 1. Jesus is the only One that resurrected and never died again. There are many founders of religion who are worshipped as gods. They all died and never rose again. Some tried to fake their resurrection, but were not seen physically afterwards. 1. Bab, Babism was buried at Mt. Carmel in Haifa, Israel (31 yrs). 2. Bahaullah, Baha’i Faith was buried in Acre, Israel (74 yrs). 3. Buddha, Buddhism was cremated in Kushinaga, India (80 yrs). 4. May Baker Eddy, Christian Science, buried in Mt. Auburn, Massachusetts (89 year). 5. Confucius, Confucianism buried in Qufu, China (70 years). 6. Mohammed, Islam buried at Mosque of the prophet in Medina, Saudi Arabia (62 years). 7. Mirza Ahmad, Ahmadiyya buried in Qadian, Punjab in India (73 years). 8. Moses, Judaism was buried by God in Mt. Nebo, Jordan (120 years). 9. Joseph Smith, Mormonism was buried in Nauvoo, Illinois, USA (38 years). 10. L. Ron Hubbard, Scientology cremated and ashes scattered in Pacific Ocean (74 years). 11. Guru Nanak, Sikhism ‘departed’ Katapur, Pakistan. (70 years). 12. Jesus Christ, Christianity was buried in Holy Sepulchre, Jerusalem but rose again on 3rd day, witnessed by more than 500 people. (33 years). 2. One the hardest thing for a religious leader to do is a funeral service. Jesus never had to attend or conduct one. The ones He was invited to became resurrection service (Lazarus; Jairus daughter). 3. Jesus is the source of all resurrections, or He is the Person that permitted it, for reasons best known to Him. But whenever He withdraws life; nothing anyone can do. Dead body (Lazarus, widow of Nain son, Jairus daughter). Heath (Woman of the issue of blood). Joy (wedding at Cana in Galilee). What is dead in your life that needs resurrecting? For Mary & Martha it was Lazarus. Yours will come alive in Jesus name. No hope is lost when you have Jesus. His presence guarantees everything. I read about an incident that happened on 28/05/1914. A ship known as Express of Ireland hit another ship and it began to sink. There was not enough life jackets on board. 130 Salvation Army Christians were on board. 109 of them drowned. Many of them removed their life jackets and gave it to those who were not born again. “I can die better than you”. They had hope in Whom is called “The resurrection and life”. Do you? Why is Jesus the life? – He is the Author and Giver of life (Natural, Spiritual and Eternal). Jesus is more than a Giver of life, He Himself is life. Jesus saith unto him, I am the way, the truth, and the life:no man cometh unto the Father, but by me. – To Him, death is mere sleeping. – No expiry date with Him: He was and is and is to come. Always be. And the four beasts had each of them six wings about him; and they were full of eyes within:and they rest not day and night, saying, Holy, holy, holy, Lord God Almighty, which was, and is, and is to come. What can Jesus give life to? Martha believed that Jesus can give life to Lazarus, but in a distant future. The day of the resurrection of the dead. Mary, on the other hand, was put off that Jesus decided not to come to their rescue when they needed Him the most. She became withdrawn and was questioning Jesus motive. Do you believe Jesus can be of help to you now? Or you have given up. Do you fall into the category of those who are questioning Jesus motive? What you need to believe is that He can do all things. May the resurrection and the life demonstrate His name in you in Jesus name. Father, let every precious gift you have given me that had died resurrect again. Father, make my destiny to enjoy the power of Your resurrection. Father grant me a newness of life daily. Father, let the evidence of Your new life be seen in me. 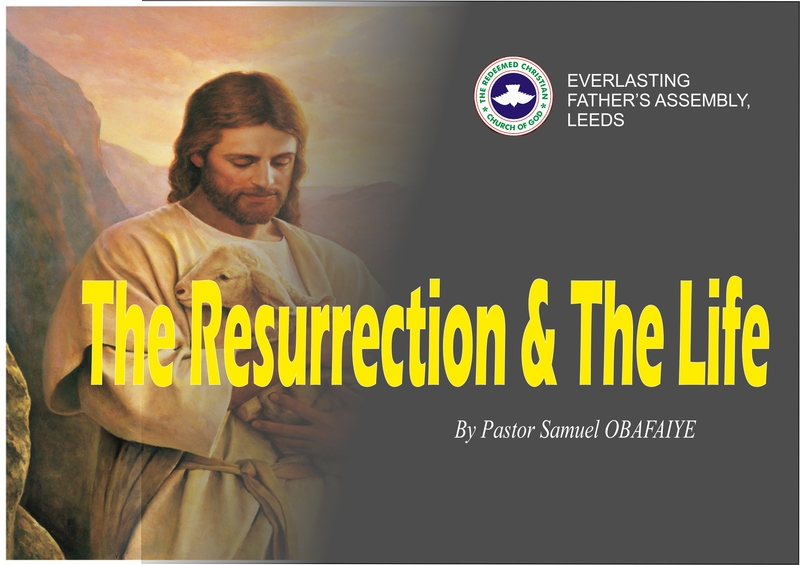 The sermon, The Resurrection And Life, by Pastor Samuel Obafaiye, was delivered on Easter Sunday April 1, 2018.